The International Space Station (ISS) is in our evening skies again between 22 September and 13 October 2018. You’ll be able to see it every clear night from anywhere in the UK, gliding through our skies as a brilliant star. It appears brighter than most planes, despite being hundreds of kilometres away, and on good passes you can watch as it passes well over central Europe. Amaze your friends with your predictive powers! The ISS appears as a very bright star, and once you get accustomed to its appearance you can pick it out easily. Although some nearby planes appear just as bright, you can also see their red and green wingtip lights and probably hear them as well. The ISS, of course, is totally silent. You need to get predictions to see it for each day and for your own location. To find out how, look at our help file which tells you how to get predictions, and, just as important, how to turn those predictions into a successful observation! We also have a more detailed help file which tells you more about the ISS and gives further tips for observing it. But don’t leave it too long! The series ends on 13 October, and you won’t be able to see it again from the UK in the evening until the end of November. 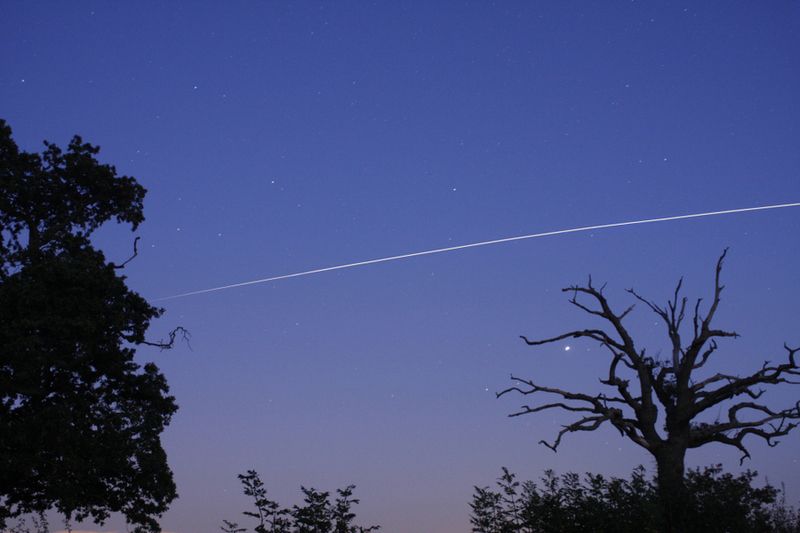 The ISS moves quite fast through the sky, so it’s very hard to view it through a telescope. If you are lucky enough to do so, usually only briefly, with a magnification of 25 or more, you could actually catch a glimpse of its shape, with a central fuselage and solar panels roughly in the shape of an H. It’s even possible to make a video of it crossing the field of view of a webcam or DSLR attached to your telescope, if you aim it at the precise point where the ISS will cross the sky. With skill, you can even combine the individual frames to compile an image of the space station. Our help file gives more information on photographing either the trail of the ISS as it crosses the sky, or in detail. Give it a try!